Written by colinvdbel on November 15, 2009 to Exclusive, Live and Roxette. On Friday the 13th of November, the Daily Roxette joined Roxette at the Gelredome in Arnhem for a wonderful night. During the first half of the Night of the Proms, a Swedish symphony called ‘Midsommarvaka’ magically changed into the first string arrangements of ‘Wish I Could Fly’. After the stunning synergy between Roxette and Il Novecento, the presenter of the evening promised more Roxette during the second half. In the intermission, The Daily Roxette had an exclusive interview with the Man himself. First of all, welcome back in Holland Per! How does it feel to be back so soon after the concert in Amsterdam earlier this year? It was a different story. But it was great, of course, coming here with Marie, Jonas and everything else - it’s cool, yeah. And we look forward to having these seven nights in a row in Rotterdam. I remember playing in Ahoy before. It’s a great crowd. So what are your feelings about the Proms, since it’s such a bizarre thing on its own? It is. Very much so. It’s impossible to understand, unless you see it for yourself. You have to really be a part of it to understand it. It’s really hard to describe to friends at home what we are actually doing - it’s fun, it’s great! It’s also a great step. I think it’s a very clever move of Marie, instead of doing a full tour or a full concert. She’s not ready to do those things. With Night of the Proms you share the responsibility with other artists, and you're just doing your four or five songs. And we're doing lots of shows, so she's getting back into the concert mode. Written by tevensso on October 24, 2009 to Live and Roxette. Source: Aftonbladet. Yesterday Roxette played together as "Roxette" for the first time in over eight years (The "Room Service" tour, 2001) at Night of the Proms in Antwerp, Belgium. Swedish newspaper Aftonbladet reports that Marie was certainly the star of this bizarre evening. Roxette gets 3/5 for the concert, and probably would have gotten more hadn't they been so rusty the first song. "There's no doubt she's enjoying being part of Roxette again" Håkan Steen writes. It's very clear to Håkan that both Per and Marie want this more than anything, and more is to come. "Per twangs his guitar like he never took a break [he didn't! ed.] and it's very touching seeing Marie's smile in 'It Must Have Been Love' when she realizes they still have an audience and it wants to sing along!" Håkan continues mentioning that she doesn't move on stage like she used to and her voice is nervous, but warms up by all the love flowing from the numerous fans there. Written by colinvdbel on October 23, 2009 to Live and Roxette. Source: Het Nieuwsblad. "Swedish supergroup Roxette makes comeback at Night Of The Proms"
"We have missed the stage and our fans"
They were supposed to come seven years ago, if it wasn't for the fact that Marie Fredriksson (51) was diagnosed with a brain tumor. She fought for her life, and kept dreaming of a Roxette comeback. Belgium gets that honor. Tonight she will stand on the stage of Antwerp's Sportpaleis, together with Per Gessle (50). "No-one can imagine how much we are looking forward to this." One big question remains this year at Night Of The Proms: can Roxette, the Swedish pop duo consisting of Marie Fredriksson and Per Gessle, still manage to overwhelm an audience with their hits? And most importantly: is Marie's voice still as good as before 2002, when she was diagnosed with cancer? At the Diamond room of the Antwerp Radisson Blu hotel, Marie left a somewhat weak impression. She was a bit timid, said few words in a slow pace. However, we don't have to worry, according to her entourage. On stage she's still a bomb. Written by tevensso on October 20, 2009 to Live and Roxette. Source: Roxette.se. Written by roxeteer on October 7, 2009 to Live and Roxette. To meet the demand for tickets, there will be an additional Night of the Proms concert in Antwerp, Belgium on November 11. This brings the number of concerts in Antwerp up to 13. See the full list of Proms concerts. It may also interest you that Night of the Proms is on Twitter: @nightoftheproms. Written by roxeteer on September 17, 2009 to Live and Roxette. Written by tevensso on July 4, 2009 to Live, Per Gessle and Releases. Source: Gessle.com. HALMSTAD - Per has sent out the tracklist of the new live CD with bonus-DVD. He Tweets that the album will be released as a normal-priced CD with a free DVD included. Written by tevensso on June 28, 2009 to Live, Per Gessle and Releases. Source: Gessle.com. HALMSTAD - Per has sent us the tracklist of the forthcoming double-LP. The CD that will be included with the DVD (or if it's the other way around) will not have the full concert, due to the space restrictions of a CD. Incidentally, this is the full concert. According to Per the album and DVD will be released in early September. Written by tevensso on June 24, 2009 to Live, Per Gessle and Releases. HALMSTAD (Updated) - Per Gessle has revealed on Twitter that his forthcoming live album will be titled "Gessle Over Europe," resembling Paul McCartney's tour name from 1972, "Wings Over America." There are "no further comparisons," says Per in his tweet. Per's live album will be released as a double-LP as well as a CD included with the DVD. Per seems to be very excited about it. "I received the album masters the other day and they sound terrific" Per says. Per has also written on Twitter that the live recordings included on the album are from Cologne, London, Copenhagen, Amsterdam, Stockholm (day 2), Warsaw, Halmstad and Munich concerts. The LP will contain three, possibly four, bonus tracks, while the DVD will contain the full Stockholm #1 concert. EMI is working full time to get the material done before the vacations start and Per mentions the albums preliminary will be released early September. Written by Lars-Erik_Olson on May 27, 2009 to Live and Roxette. (Updated) - Editor's Note: The Daily Roxette originally published this article over a month ago – on April 22 to be exact – announcing that Per and Marie were reuniting and would perform again as Roxette in Lativa this summer. This article was published prior to our breaking the news on May 4 that Roxette would appear at the Night of the Proms concert series. We're republishing it today, along with the previous comments. 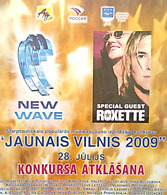 While mention of Roxette has still not appeared on the event's own website, posters have been put up on the streets of Riga advertising Roxette as "special guests" at the opening of the New Wave festival and today, Per acknowledged the accuracy of our report via a Twitter message. Roxette are back together again! According to several published reports, the first of which appeared on Monday [April 20], the duo is set to perform for the opening of New Wave 2009 on July 28 in Jurmala, Latvia. Some of the biggest newspapers of Latvia and their online news portals have reported that Roxette have already agreed to appear at the opening ceremony of this annual international young pop singers competition. In an editorial published by The Daily Roxette just days ago, we addressed the speculation that Roxette might reunite, and since then there have been rumors of exactly when and how that might happen, with most centering around the Night of the Proms series of concerts in Europe towards the end of the summer. From its beginnings in 2002, the New Wave competition has become a significant event not only in Russia and Latvia, but also in CIS and other countries for several years once television rights were sold. Millions of TV viewers watch and support the contestants, confirming the fact that New Wave has become a eagerly-anticipated annual European festival. TDR has learned that this this festival is very popular in Russia, as many of the participants come from post-Soviet countries and regions. We've also reported on this event previously, when in 2003 a contestant from Sweden sang "Sleeping in My Car."